What you might consider trash, Recology calls resources – just a simple change in perspective. This is why we describe what we do as resource recovery. Recology implements recycling programs and builds infrastructure at its facilities to recover recyclables and reduce landfill-bound materials. By seeking out and utilizing new technology systems to sort and extract materials, we’re able to return organic materials to farms as compost, and provide recycled raw materials (such as plastic or aluminum) to manufacturers. While you’re collecting your food scraps and yard trimmings, and accumulating your recyclables, Recology is engineering and developing programs and services to recover and reuse both. Take a simple plastic bottle, for example. These plastics can be recycled through the collection and recovery systems at Recology, and made into new products, like jackets made from these recycled plastic bottles. You might even see your old furniture as part of an art installation one day. This recovery process is crucial in reducing the impact of waste on our environment, and moving beyond waste. Want to know how Recology can help you increase your recycling and composting efforts at your home or business? Learn how. On average, Recology recovers over 600 million pounds of recyclables each year, and we’re continuously researching ways to recycle more items to be made into new products. Our latest engineering effort has been in planning, designing and implementing a system constructed to collect and recycle “film plastics” – which are used to make items like grocery bags. Historically, film plastics were a hard-to-recycle item with little to no end-market. Recology is working to change this. Recology designed and built the first large scale compost facility in California in 1996. 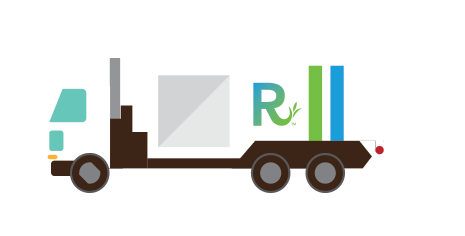 Today, Recology recovers food scraps and yard trimmings that are disposed of, and from this material manufactures over 1 billion pounds of compost annually. The compost Recology makes from your organic materials are then used by local farmers to grow food, which is returned to you in the form of fresh produce, grains, or even wine. In 2013, Recology sold 296 million pounds of compost in California alone. Learn more about our compost by visiting Recology Organics. As they say, one man’s trash is another man’s treasure. Our team of engineers and sustainability experts are always searching for new uses for recovered resources. We work together with manufacturers to solve for industry-wide challenges. Much of our work in waste processing begins with research. We take a three-pronged approach: our environmental engineering team seeks out emerging technologies throughout the world; we create pilot programs to challenge the status quo and find new answers; and we partner with other entities to research and identify new technologies for advanced materials processing. Are you part of the emerging technology space or want find out about upcoming pilot programs? Contact us. Plastics need to be sorted into “like” plastics before baling, and optical sorting is one of the most efficient and remarkable ways to do so. The technology automatically sorts three common types of plastics with an infrared sensor: hard, clear, and colored. The sensor records the size, shape, structure, and position of the plastic on the sort line, and once identified, it hits the plastic with a strong puff of air, sending it into the correct plastics collection bin. Good compost needs added air and water. With a Negative ASP System, organic material sits on perforated pipes in open air, which pulls air down from the compost piles, making it easier to control moisture, oxygen, and microbial levels. The air that is pulled from the compost pile is processed through a bio-filter, which absorbs odors and volatile organic compounds. Check out Recology Organics to buy compost. In 2013, Recology teamed up with G2 Energy to install a landfill gas-capture system at Recology Hay Road in Vacaville, CA. This system pulls the methane gas generated by the landfill and turns it into electricity to power homes and businesses nearby. The methane gas that’s pumped from the landfill is sent to an energy conversion facility operated by G2 Energy. As a result, the methane captured from the landfill is now providing 1.6 megawatts of electricity – Enough to power up to 1,600 homes. This is equivalent to taking about 13,000 cars off the road, planting 14,500 acres of forest or otherwise offsetting consumption of approximately 7.6 million gallons of gasoline. After we sort and recover resources from the compost and recycling containers, the next step is finding ideal uses for these materials, or commodities. That means finding manufacturers who commit to using our commodities for the best and highest use – those who are using our commodities to create further recyclable goods that will continue the recycling chain. We’re always looking to build relationships with like-minded commodities partners and manufacturers. Contact us to find out more about recovering resources together. Are you a recycled commodity customer? Login here to pay your bill online. Are you an organics commodity customer? Login here to pay your bill online.